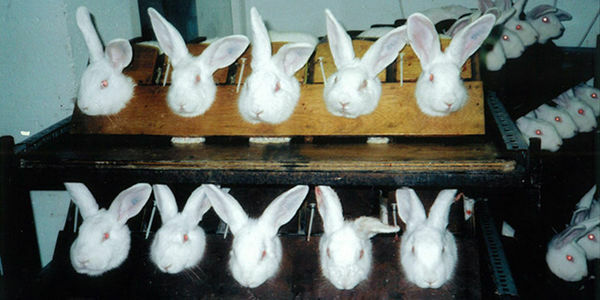 Rabbits, guinea pigs, hamsters, mice, and rats are regularly being blinded, poisoned, and killed to test lipstick, mascara, cologne, and other cosmetic products. Beauty should not come at such a cruel price. The Humane Cosmetics Act, sponsored by U.S. Reps. Martha McSally (R-AZ), Don Beyer (D-VA), Ed Royce (R-CA), Tony Cárdenas (D-CA), Frank LoBiondo (R-NJ) and Paul D. Tonko (D-NY), will end unnecessary cruelty by prohibiting animal testing for all cosmetic products manufactured or sold in the U.S. In more than 30 countries, this outdated practice has been phased out, including Norway, Switzerland, Israel, India and every country in the European Union. There is absolutely no reason why animals in the U.S. must continue to needlessly suffer and die in experiments to test cosmetics. Sign today and urge your U.S. Representative to support for the Humane Cosmetics Act to prohibit animal testing for cosmetics manufactured or sold in the U.S.
As your constituent, I urge you to cosponsor the Humane Cosmetics Act, sponsored by U.S. Reps. Martha McSally (R-AZ), Don Beyer (D-VA), Ed Royce (R-CA), Tony Cárdenas (D-CA), Frank LoBiondo (R-NJ) and Paul D. Tonko (D-NY). This legislation would prohibit animal testing for cosmetics manufactured or sold in the U.S. There are thousands of existing ingredients with a history of safe use, which allow more than 600 North American companies to create innovative products without the need for new animal testing. For new ingredients, non-animal safety tests are often cheaper, faster and more relevant to humans, and therefore more reliable predictors of safety. Passage of the Humane Cosmetics Act would align U.S. law with more than 30 countries that have already banned cosmetic animal testing and the sale of products tested elsewhere. Countries whose populations total more than 1.8 billion people ban animal testing, and U.S. companies that sell in those countries are expected to comply with those bans.